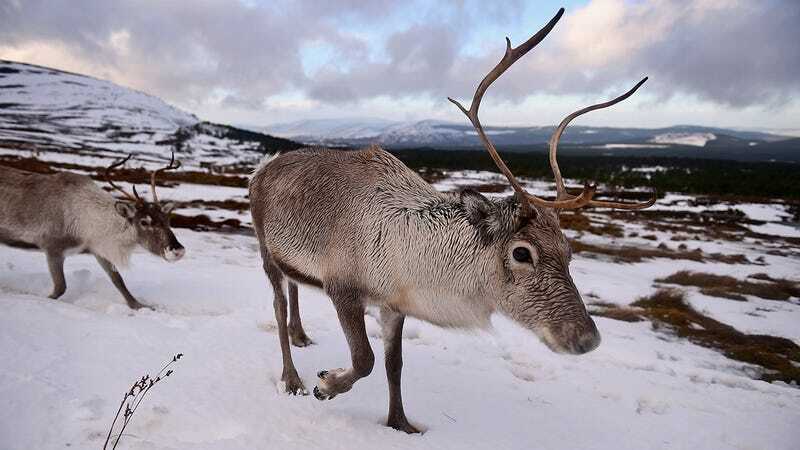 New evidence suggesting a major turn of events in the war on Christmas was presented Monday at the Fall Meeting of the American Geophysical Union—the world’s reindeer population is declining, rapidly. The increase in industrial development has affected the reindeer of the Taimyr Peninsula, who have started migrating east to avoid humans. But researchers found that the reindeer had also shifted north to find cooler grounds and escape mosquitoes, which are becoming more commonplace as the region warms. “We know in the last two decades that we have had an increase in temperatures of about 1.5C overall. And that definitely impacts migration patterns,” Petrov said. “Reindeer are tremendously important for biodiversity - they are part of the Arctic food chain and without them other species would be in trouble,” the scientist warned. It seems pretty simple to me—if you’re a solider of Christmas, you must fight against climate change in order to prevail. We must stop climate change, so Christmas can survive.